Continue for programming jargon and words. Constraints Killing You? Blame Auto-Layout. I recently made a new project and when I ran it the UIButtons and UIViews would all change size and weird things would happen. I now understand that it was merely the auto-layout completely freaking out and trying to fit things into a space in which they already fit. 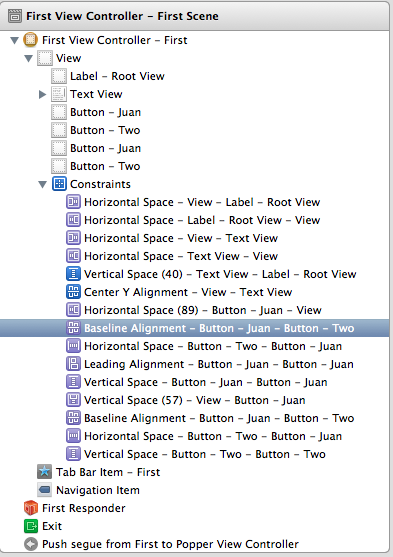 Here is what the constraints look like in Xcode. They seem to show up automatically and cannot be manually deleted. I deleted a few of them before I realized that they’d come back even stronger. I’m sure it works for someone to fix their app into both the 3.5″(old + retina) and 4″(iphone 5) versions of the iPhone now. I’m sure the new versions of XCode will work quickly to fix this feature. 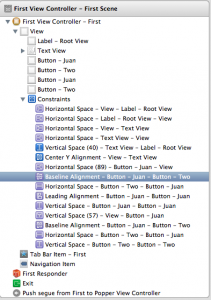 When I was struggling to figure out what is wrong I realized constraints would prevent me from moving UIViews around the screen. That more than anything else really bothered me. To impinge on normal functionality is a cardinal sin.